10/15 from the 2011 Treasure Hunt series. 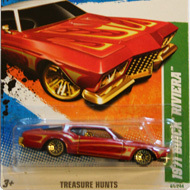 The Funny Car features green metal flake paint; orange, yellow and green stripes; “hot wheel$”, “TH”, and “TREASURE HUNT” on the sides, the Hot Wheels logo on the hood, and other graphics. 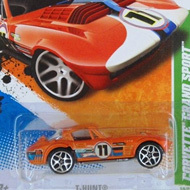 It has clear windows, an unpainted metal interior, 5-spoke wheels, and an unpainted metal Malaysia base.